Compact and mobile, the DC2560T1 is ideal for finishing work. With DeWalt’s new FLEXVOLT cordless air compressor, you can leave your extension cord in the truck. This compressor is perfect for professional finishing carpenters: It’s compact and light, with a built-in handle and roll cage, so moving from room to room has never been easier. And its brushless motor, heavy-duty oil-free pump and 2.5 gallon pancake tank allow you to drive as many as 1,220 brad nails per charge when using a 6.0 Ah FLEXVOLT 60 volt battery pack. 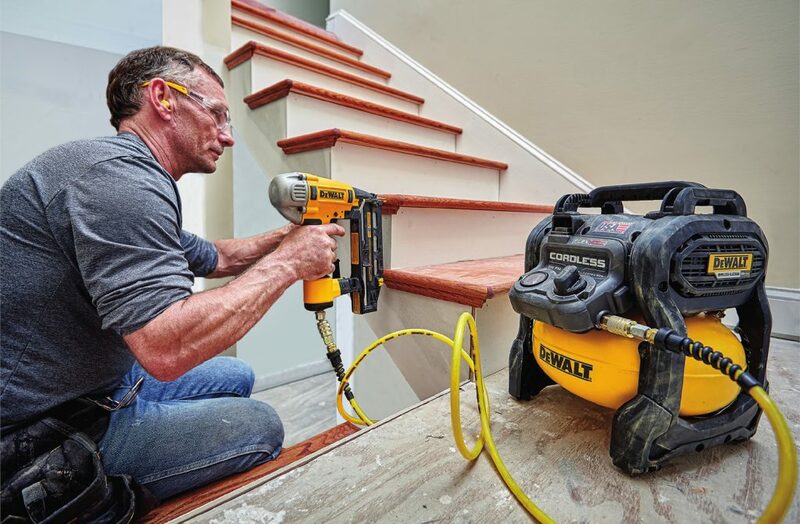 Whether you’re installing trim, crown, casing, wainscoting, siding or flooring, the FLEXVOLT cordless air compressor provides mobility and convenience. It has the capacity to power brad nailers, staplers, finishing nailers, pinners and more. You can also use it around the garage to inflate tires. 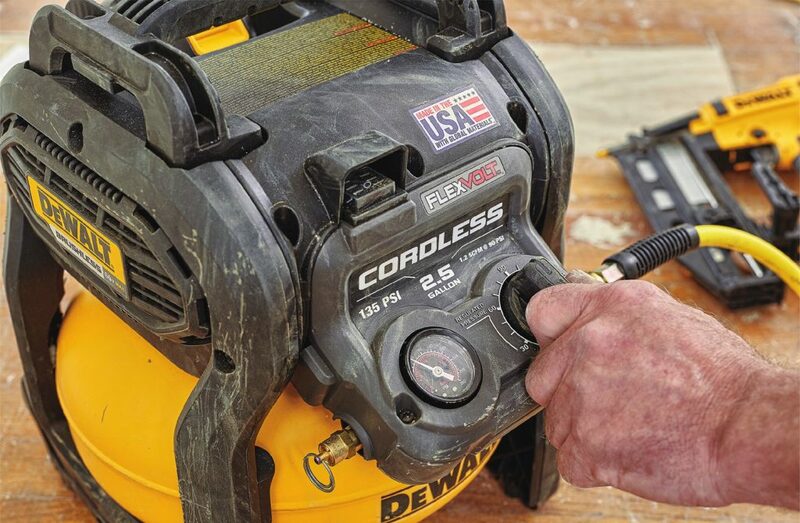 DeWalt’s OneTurn regulator makes it easy to set the output pressure. DeWalt equipped the DC2560T1 with its OneTurn regulator, which lets you to set the working psi without eyeing an output pressure gauge. The OneTurn regulator is marked with common pressure settings and regular intervals, so it’s faster and easier to set output pressure. In addition, it occupies less space than the typical two gauge setup. 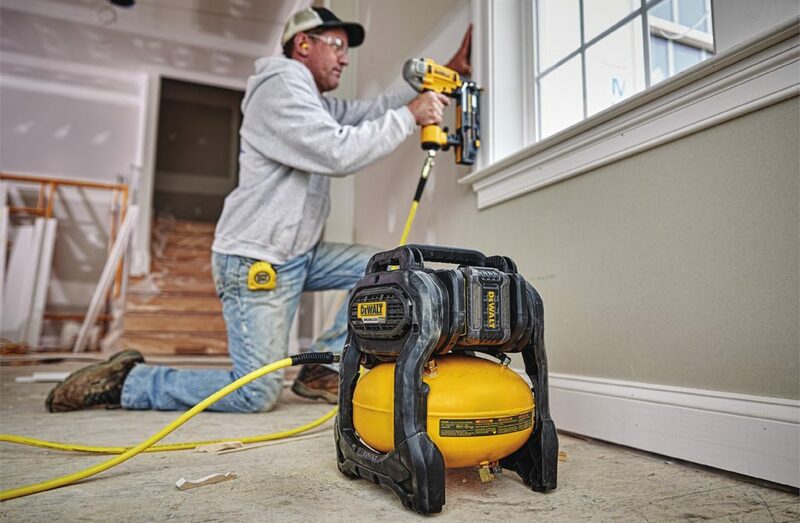 If you are thinking about trading in your old hot-dog compressor, consider the DeWalt FLEXVOLT cordless air compressor. It’s compact, lightweight and delivers enough air to handle a range of finishing applications. It’s also compatible with DeWalt’s growing lineup of FLEXVOLT cordless tools. Ultimately, this compressor upgrades the mobility and convenience of a traditional hand-carry portable compressor and allows you to be more productive over the course of a work day. Stop by your nearest KMS Tools location or check out kmstools.com today for a great price on the DC2560T1 cordless air compressor kit, which includes a 6.0 Ah battery, a fast charger and the compressor. For additional runtime, check out DeWalt’s FLEXVOLT 9.0 Ah battery pack, now available in store and online. 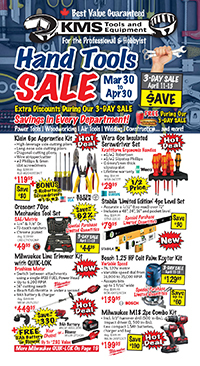 This entry was posted in Air Compressors, Archives, Cordless Tools, New Tools, Power Tools and tagged Compressors, cordless tools, DeWalt, flexvolt, new tools, Power Tools by Your Friends in the Tool Business. Bookmark the permalink.